Infiniti announced earlier this year that it would be adding a 3-row crossover to its fleet, but only released a single teaser image. However, our spy photographers managed to catch up with the CUV while testing, giving us our best look yet at the people-friendly hauler. Unlike the last time our spies nabbed the JX, we have detailed inside and out photos of the big crossover, which appears to be ready for its late summer debut. Designated JX, the model will 1st be shown in concept car form at the Pebble Beach Concours d’Elegance in August before a production model debuts at the Los Angeles Auto Show in November. Sales should begin in early 2012. The JX will slot in above the 5-seat FX, which might not be redesigned when it is due in a few years, and below the 7 or 8-seat QX. The new JX will go up against rivals from Mercedes-Benz (GL-Class), Audi (Q7) and Lincoln (MKT). For the most part, Infiniti appears to be ahead of the curve in offering a true 3-row crossover to luxury buyers. Most rivals have stuck with either 5-seat models or more utility-oriented SUVs like the Lexus GX 460 and Land Rover LR4. 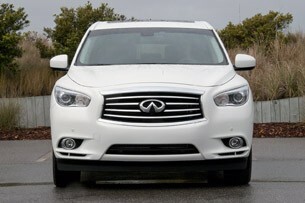 Infiniti will almost certainly continue to offer its QX56, which went on sale barely a year ago. Sales of the boxier QX56 have been brisk, exceeding Infiniti’s expectations despite its hefty fuel consumption. Although Infiniti has shifted to rear-wheel drive in recent years, the JX is expected to ride on Nissan’s front-wheel drive “D” platform. Nissan’s D platform underpins vehicles like the Maxima, Altima and Murano, and will give the JX the ability to offer all-wheel drive. 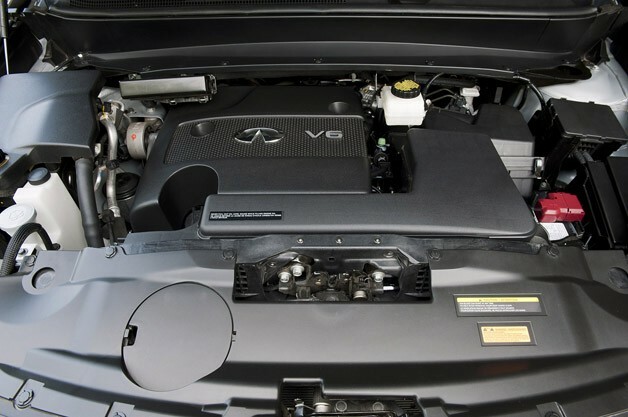 Infiniti’s 3.7-liter V6 is certainly a possibility for the JX, but a number of trademark filings — including JX20, JX25, JX25h, and JX30 — suggest Infiniti could be considering downsizing. 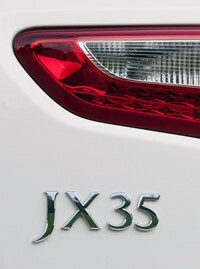 Whatever the case, expect a hybrid model to be part of the JX lineup. Outside, the JX clearly takes inspiration from the Audi Q7, at least in terms of its overall shape. In fact, at 1st glance, these photos could be of a camouflaged mid-cycle update for the Q7. But the difference is in the details; the JX uses Infiniti’s swoopy styling all around, drawing heavily on themes presented last year when the QX56 was unveiled. For the 1st time ever, we now have a good look at the JX’s interior. Switchgear is borrowed heavily from other Infiniti models, like the automaker’s unique round heated and ventilated seat knobs and its small leather-wrapped gear lever. The design isn’t as expressive as that found in the company’s midsize M sedans, especially when it comes to a more conservative door panel treatment. But that’s fitting for this segment, which should be fairly high volume for Nissan’s luxury brand. Look for more details to leak out over the coming months about the upcoming JX crossover. Consumers looking for a sports coupe, sports sedan, sporty 5-passenger crossover, luxury 5-passenger crossover, trailer-capable SUV, sporty convertible or hybrid luxury sedan have been able to drive out of Infiniti showrooms very satisfied. The automaker offers a well-curated family of vehicles for each of these genres, without question. However, affluent families seeking an import luxury 7-passenger crossover – without a traditional truck lineage – have been forced to shop elsewhere. Many of Infiniti's missed opportunities end up holding keys to an Acura MDX, Audi Q7 or Volvo XC90. Aiming to close a gaping leak in its product range, Infiniti officially introduced the world to its all-new JX crossover at the Los Angeles Auto Show just a few months ago. 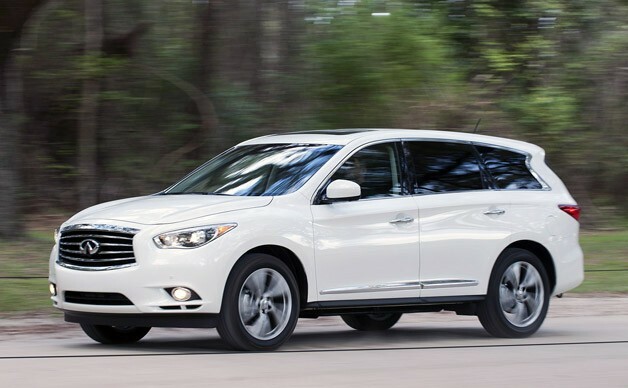 The new arrival has been engineered to "excel in the areas that luxury crossover buyers desire most – interior flexibility and roominess, safety, and advanced hospitality features," says Infiniti. But to us, some of those qualities seem to stray from the company's 'Inspired Performance' tagline. Intrigued by the new arrival, we climbed aboard an airliner and flew to Charleston, South Carolina, for an introduction and test drive of the JX crossover. Nissan Motor Corporation, the wizard behind the Infiniti brand, has chosen its fresh 'D platform' for the new JX (it's the 1st of several vehicles to be introduced on the unibody front/all-wheel drive chassis that will also be shared with the 2013 Nissan Pathfinder). Like the Murano and Maxima, a crossover and a sedan that also share some of the JX's architecture, the chassis is designed for a transverse-mounted engine – the Infiniti brand's 1st since dropping the compact G20 sedan more than a decade ago. The JX features one of Nissan's familiar 6-cylinder engines, which is no surprise. However, instead of fitting the crossover with a 3.7-liter VQ, the automaker has selected its 3.5-liter 'VQ35DE' variant shared with the current Maxima (the all-aluminum powerplant makes 25 additional horsepower under the hood of the Nissan sedan and more torque thanks to packaging advantages). Naturally aspirated and lacking direct injection, it is rated at 265 horsepower at 6,400 rpm and 248 pound-feet of torque at 4,400 rpm. Mounted sideways in the engine compartment, the engine is mated to a Continuously Variable Transmission (CVT). Nissan has been using this type of gearbox for more than a decade, but this application is a 1rst for Infiniti (the M35h Hybrid has a traditional 7-speed automatic). The standard configuration is front-wheel drive, though we suspect many buyers will splurge for Infiniti's optional Intelligent All-Wheel Drive, which sends 100% of the torque to the front wheels under dry conditions. Other mechanical tidbits include an independent strut-based suspension up front with a multi-link in the rear, while the steering is hydraulic-electric with vehicle-speed sensitive boost. There are internally ventilated disc brakes at all 4 corners, each clamped by a single-piston sliding caliper. Standard wheels are 18-inch alloys (wearing 235/65R18 all-season tires) with 20-inch wheels optional (tire size 235/55R20). Infiniti has come out swinging when it comes to configuring the JX. Shoppers will find leather seats, tri-zone climate control, power rear liftgate, privacy glass, keyless entry, heated seats, bi-xenon headlights, Bluetooth connectivity, full power accessories and more as standard equipment on the base JX FWD (starting at $40,450). 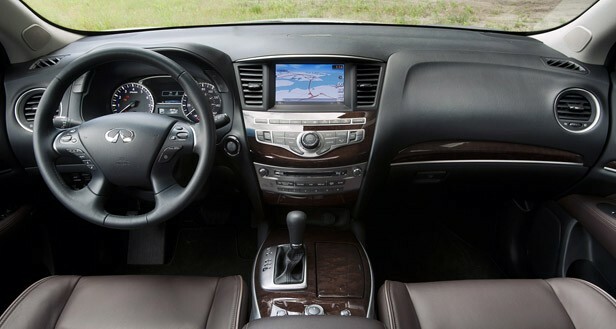 However, Infiniti handed us the keys to a loaded 2013 JX AWD (base price $41,550). Our Moonlight White over Wheat leather upholstery test vehicle was fitted with the $4,950 Premium Package (HD-based navigation, Bose audio, Around-View monitor, Intelligent Key and more), $1,700 Theater Package (dual 7-inch 2nd-seat monitors, wireless headsets and 120-volt power outlet) and the $2,200 Driver Assistance Package (Intelligent Cruise Control, Blind Spot Warning, Back-Up Collision Intervention, Distance Control Assist, heated steering wheel, remote engine start and more). Add the $950 destination/handling fee, and the final MSRP on our 5-door luxury crossover totaled $51,350. In the 7-passenger import luxury crossover segment, the aggressive pricing of the all-new JX undercuts the base price of the aged Acura MDX ($42,930) and elderly Audi Q7 ($46,250), but not the decade-old Volvo XC90 ($39,500). Optioned similarly, the Infiniti will still be the least expensive with the most equipment. We put about 200 miles on the new JX, mostly on secondary highways in South Carolina's Lowcountry. Our speeds were moderate and the roads were crowded and rather unchallenging. Thanks to scattered rain arriving in heavy downpours, the overall driving conditions were about optimal... for an all-wheel-drive crossover. The JX cabin, unmistakably Infiniti in its warm design and high quality fit-and-finish, is configured for 7 passengers in a 2+3+2 layout. In addition to the individual driver and front passenger captain's chairs (separated by a fixed center console), second-row occupants occupy a split (60/40) fold-down bench while 3rd-row passengers sit on a split (50/50) fold-down bench. The 8-way power-adjustable driver's seat is plenty comfortable, but we wished it were mirrored on both sides of the cabin as the front passenger is relegated to an inferior 6-way power-adjustable throne that our 6-foot, 2-inch frame didn't find nearly as appealing. 2nd-row seating, which Infiniti says is more accommodating than a Cadillac Escalade, is comfortable for adults. The automaker has ensured that the 3rd-row is easy to access with an innovative rail and pivot system on the right seat that moves the bottom cushion up and out of the way (check out our Short Cut video for a closer look). It will even do so with a child seat strapped in place. There is technically more legroom back there than in the Acura MDX or Audi Q7, but nobody is going to call it roomy even with the 2nd-row slid forward six inches. With a press of the start/stop button, the 3.5-liter V6 stirred to life quietly. Instead of going with the latest electronic gear selector, which frees up space in the center console, there is a console-mounted shifter and a traditional foot-operated parking brake. While a CVT isn't our 1st choice for a gearbox, it is fuel efficient and undeniably smooth. Early on, we chose to leave Infiniti's Drive Mode Selector (with Standard, Sport, Eco and Snow settings) in Standard after finding the artificial 'cogs' of Sport mode very unnatural and the parsimonious Eco mode annoyingly frustrating. The power delivery from the trusty 3.5-liter VQ won't snap any necks (we estimate the 4,419-pound JX will do 0-60 in about eight seconds), but it was more than sufficient to move the Infiniti down the road with poise and resolution, if not passion – the CVT extinguishes any urge for enthusiastic driving. According to the EPA, the JX AWD earns 18 mpg city and 23 mpg highway with a combined rating of 20 mpg (the FWD model earns 18 mpg city and 24 mpg highway with a combined rating of 21 mpg). According to our trip computer, we averaged 19.1 mpg during our daylong venture. For the most part, we found the ride comfortable and the cabin adequately void of wind noise (the JX boasts a .34 coefficient of drag). The non-adjustable suspension isn't engineered to be sporty and the standard all-season tires aren't designed for tenacious grip. Nevertheless, abrupt steering inputs (e.g., avoidance maneuvers) were easy to control but replete with significant understeer. We would have preferred more suspension travel in the crossover, as the JX reacted harshly to severe potholes and/or large dips in the road. 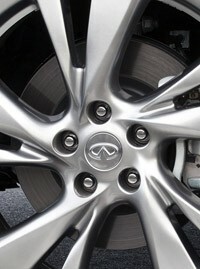 At one point, the Infiniti bottomed-out its suspension when we encountered one deep dip at highway speeds. The four-wheel disc brakes brought the JX to a halt without drama and with good modulation. The official tow rating is a modest 3,500 pounds – if you want to tow a trailer, Infiniti will gladly sell you its flagship body-on-frame QX56. Few will choose to purchase or lease the all-new JX based on its acceleration, handling and braking. The JX will entice buyers with its standard luxury and long list of standard and available technology – its linguist-confusing soup of acronyms designed to improve both active and passive safety. The familiar and/or self-explanatory include the JX's Lane Departure Warning (LDW), Anti-lock Braking System (ABS), Intelligent Cruise Control (ICC), Advanced Climate Control System (ACCS), High-Intensity Discharge headlights (HID), Lane Departure Prevention (LDP), Advanced Air Bag System (AABS), Vehicle Dynamic Control (VDC), Electronic Brake Force Distribution (EBD), Around View Monitor (AVM), Blind Spot Intervention (BSI), Blind Spot Warning (BSW), Brake Assist (BA), Tire Pressure Monitoring System (TPMS) and Remote Engine Start System (RESS). The innovative Distance Control Assist (DCA), Forward Collision Warning (FCW) and Intelligent Brake Assist (IBA) work together to help slow and stop the JX in traffic and/or warn the driver of an impending collision while the brilliant Backup Collision Intervention (BCI) and Moving Object Detection (MOD) help the driver identify and avoid collisions with objects while in Reverse. Prefer pampering over technology? 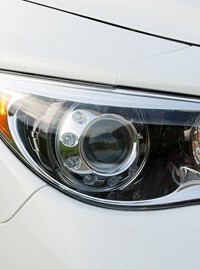 Infiniti coddles its discriminating buyers with its subscription-based Infiniti Connection and Infiniti Connection Plus telematics systems (both are complimentary the 1st year of ownership). Services include crash notification, emergency calling, roadside assistance, remote lock/unlock service, drive zone boundaries, speed alerts and more. Lastly, the impressive Infiniti Personal Assistant program (standard for the 1st 4 years of ownership) allows owners to call a concierge service for assistance with just about anything at all. Just for grins, we called to find out when Haley's comet will make its next appearance and the operator at the other end quickly replied that the famous celestial traveler will arrive on approximately July 28, 2061. Um, okay. 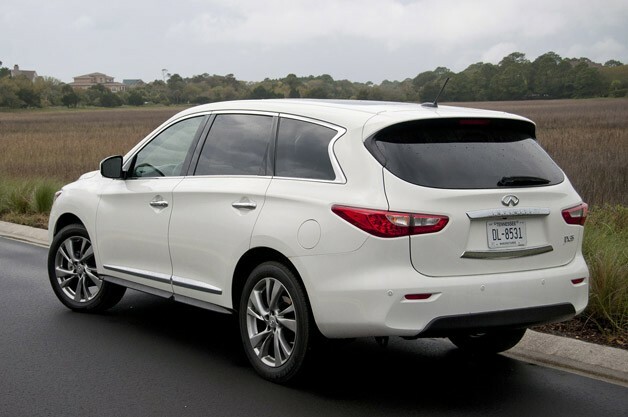 The all-new 2013 Infiniti JX is very good at safely and comfortably transporting 7 passengers between 2 points on the surface of our planet, but as a driving machine, it completely failed to raise our pulse. Even worse, its design set off our internal alarms. Blame the sum of its primary building blocks – a dull powertrain, an isolating passenger cabin and an overwhelming deluge of intrusive electronic nannies – components designed to remove the driver from the annoyance and responsibility of piloting a motorized vehicle. Infiniti is capable of designing engaging vehicles, ones that we actually enjoy driving – look at the G, M and FX for reference – but it really doesn't have to. Automotive marketing folks know that volume models don't need to entice discriminating enthusiasts; they only need to impress car-buying consumers. With a strong value proposition and impeccable showroom manners, this all-new 7-passenger luxury crossover should sell very well. We wish it luck, but at the same time hope that its unengaging driving experience isn't indicative of Infiniti's new direction. Infiniti will offer a hybrid version of its 7-passenger JX crossover in 2014, moving the luxury brand deeper into an alternative-powerplant strategy. The addition will be called the QX60 Hybrid, in accordance with this year's planned portfolio-wide change in product names. Infiniti says it will deliver a 24% improvement in fuel economy and retail for about $3,000 more than the nonhybrid version. Infiniti plans to unveil the hybrid version this month at the New York auto show. Infiniti already is selling a hybrid powertrain version of its flagship M sedan, and recently revealed that it will also introduce a hybrid version of the upcoming Q50 this summer when that nameplate replaces the G37. That will be 3 key hybrid products for the 2014 model year. Infiniti also plans to introduce an all-electric sedan in 2014, using the architecture of the Nissan Leaf. Infiniti vowed to put hybrid gasoline-electric powertrains into more models after parent company Nissan Motor Co. developed in-house hybrid drives in 2010. "This allows us to offer power performance while still reaching what we believe will be best-in-class fuel economy," an Infiniti brand spokesman says. "Luxury customers want both." Final EPA figures are not available, but Infiniti estimates the hybrid will deliver 26 mpg in combined city and highway driving, compared with an EPA-rated 21 mpg combined for the nonhybrid front-wheel-drive 2013 JX. 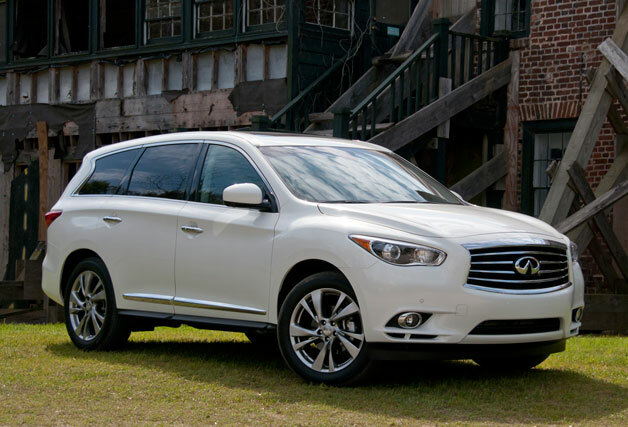 The QX60 Hybrid operates with a supercharged 2.5-liter 4-cylinder engine teamed with a 15 kilowatt electric motor, delivering 250 net hp. The nonhybrid JX uses a 3.5-liter V-6 and produces 265 hp. The hybrid system's lithium ion battery module is positioned under the crossover's 3rd-row seat and will not affect the vehicle's interior cargo area or floor space. Infiniti introduced the JX in March 2012. It was the brand's 2nd-highest volume product after the G last year, as retailers sold 21,674 units. It is built in Smyrna, Tenn.
U.S. sales of the Infiniti G last year rose 3% to 59,844. You can reach Lindsay Chappell at [email protected]. Thanks for the info. Good review! I came on this while searching on google I’ll be sure to come back. thanks for sharing. i found good site, download one of the best hacked unblocked games. Visit games.lol for more information. 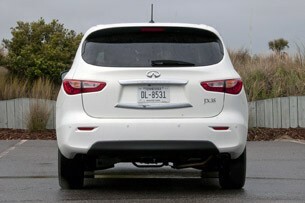 This Infiniti JX is very good in terms of safety but its design is another thing. This machine never fails, the color and equipment are generally gorgeous. I haven't done too much research into Infinity when looking for a vehicle but this certainly gives me a lot more to consider, great resource.